Our Mallorca walking holiday explores the fabulous natural landscapes of this beautiful Spanish island. Join us to escape the British winter and stroll in some wonderful Mediterranean sunshine. Many of us will think of beaches, bars and nightlife when we think of Mallorca, however, this beautiful island has so much more to offer. On this holiday we will discover the island’s other face as we hike through some of it’s most spectacular scenery; from its stunning coastline and breathtaking mountains, to the island’s peaceful interior, a land where time forgot, where tranquil, villages sit peacefully amidst groves of olives, lemons and almonds – its no wonder Mallorca is regarded by many as having some of the best walking in Europe. We start this walk from the delightful village of Deià. With its traditional buildings and colourful, flower-filled terraces, Deià has inspired artists from all over the world. We follow a scenic old trade route along the coast, passing numerous citrus orchards. We finish in the narrow cobbled streets of the historic port of Soller. This walk is known locally as the ‘Cami des Correu’- the postman’s route. Two contrasting villages make this walk extra special; Banyalbufar sits high on the cliff tops of the lower west coast, and is instantly recognisable by the terraced cultivation all around. Our linear pathway climbs up and out of the area, passing vineyards and smallholdings, to reach the equally attractive, inland market town of Esporles. 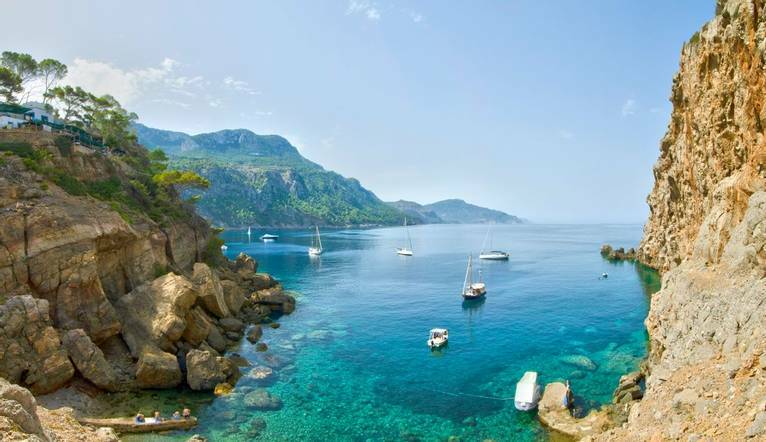 This circular hike starts in one of Mallorca’s prettiest villages, Valldemossa. Writers, artists and composers have found inspiration in Valldemossa over the years, including the Polish composer Chopin, and more recently, Michael Douglas! From here we walk uphill through almond and olive groves enjoying fabulous views of the coast. Located in the seaside town of Peguera, and just a 4 minute walk to the beach, Hotel La Concha Soul is perfectly located. Hotel facilities include a bar, swimming pool & garden. Room facilities include a terrace/balcony, air conditioning, flat screen TV and safe. Wi-Fi is available throughout the hotel. The transfer time from Palma Airport to the Hotel Concha Soul is approximately 30 minutes, depending on weather and traffic. Four guided walks are included in the programme. Your walking guide will advise you in resort of the daily programme. The walking programme is graded as Medium and you can expect to walk between 12 to 15km per day, with some ascents/descents, rough underfoot terrain and high altitudes involved. Below are the distances for each walk, however please bear in mind these are approximate and subject to change due to local conditions.